"One special seed" and months of care by an Oregon commercial pilot produced a massive pumpkin that tipped the scales at a global weigh-in Monday in Northern California, the fourth time his gargantuan plants were awarded top honors. "This all started with one special seed and a whole lot of work," said Daletas, who raises giant pumpkins as a hobby. "We were really blessed it was sunny almost every day." It was the second-heaviest pumpkin ever weighed at the 40-year-old California event, but it was still far from a U.S. record. That was set just last month when a grower in New Hampshire produced a pumpkin weighing more than 2,500 pounds (1,134 kilograms). What is a more autumn activity than racing giant pumpkins? 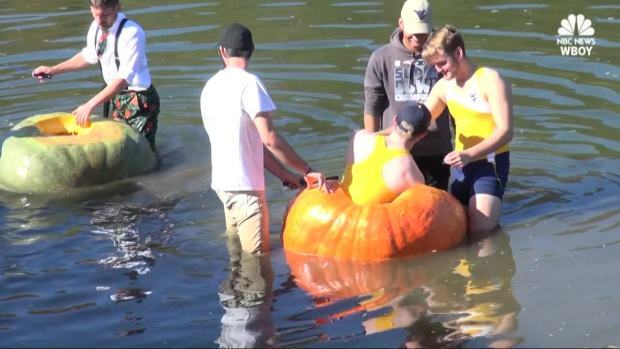 Students from the West Virginia University held their inaugural Giant Pumpkin Regatta Boat Race as part of Mountaineer Week - just in time for Halloween. The record for heaviest pumpkin in the world was set last year at a competition in Europe. A Belgium grower's winning whopper came in at just over 2,600 pounds (1,179 kilograms). Daletas, 58, needed a backhoe to place his massive pumpkin on a pickup truck for the drive to California. He said he strapped it down and drove "below the speed limit" for 12 hours to get to the contest. A crowd, including dogs and babies in pumpkin costumes, watched massive pumpkins getting weighed on a warm, sunny day as a marching band played Halloween music. The fourth-time pumpkin champ won $15,190, or $7 per pound, for the lumpy, orange pumpkin that will be showcased this weekend at Half Moon Bay Art & Pumpkin Festival. "Thousands of people will get pictures with it, which is really why we do this in the first place, to put smiles on people's faces," Daletas said. "When the festival's over, we'll probably take it home and put it in front of our house." Associated Press reporter Olga R. Rodriguez contributed. Residents are putting out teal pumpkins to help kids with allergies know where they can find treats they can enjoy. More information about this weekend's festival can be found here.